Hotel Fairmont is located near the Mall. 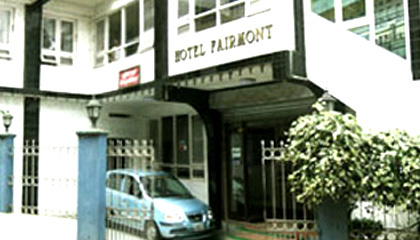 Hotel Fairmont is a leading Budget hotel in Darjeeling located near the Mall. It is popular among tourists visiting Darjeeling for offering first class facilities at reasonable rates. Hotel Fairmont provides the finest in comfort and personalized services for all kinds of visitors to the hill station. The hotel is located at the heart of the vibrant town, close to the busy shopping center, yet tucked away amidst serene and calm atmosphere. Fairmont Hotel offers well appointed rooms elegantly decorated to offer comfort and relaxation. The rooms are equipped with facilities like room heater, 24 hours hot/cold running water, television, telephone, round the clock room service and more. Fairmont Hotel has one multi-cuisine restaurant serving mouth-watering vegetarian and non-vegetarian dishes.